Apple’s iPhone XS costs $999, but that’s not the end of it. You’ll soon start seeing warnings that your iCloud storage is almost full. Apple wants $0.99 per month so you can back up your phone and photos. Apple gives every Apple ID account 5 GB of iCloud storage. This is shared for iCloud backups of your devices, iCloud photo library, application data stored in iCloud, and personal files you’ve stored in iCloud Drive. This fills up quick! Modern iPhones have high-resolution cameras and take live photos. Just a single photo can be 3.5 MB in size. Videos will be even larger. Device backups can easily use 1.5 GB per device. And you only get a total of 5 GB to store your device backups, even if you have both an iPhone and iPad. As you approach 5 GB of storage, your iPhone (or iPad) will start nagging you to pay up. Apple will even send you an email asking for more money. The cheapest iCloud storage plan you can buy is $0.99 per month for 50 GB. Apple is asking for 99 cents per month to stop the nags. That’s just a bad experience to have on a premium product, especially on a $999 iPhone XS or a top-end $1449 iPhone XS Max with 512 GB of internal storage. Apple shouldn’t be nickel-and-diming its customers, especially the ones who buy the high-end hardware. Apple has offered 5 GB of free iCloud storage space since 2011. At the time, iPhones came with between 8 GB and 64 GB of storage. Today, over seven years later, Apple still offers 5 GB of free iCloud storage space. The latest iPhones come with 64 GB to 512 GB of internal storage. This feels like the 16 GB iPhone situation all over again. Apple included 16 GB of storage on the base iPhone models up until the iPhone 6s. The iPhone 7 thankfully bumped up the base model to 32 GB, and the iPhone 8 bumped it again to 64 GB. But this only happened after years of complaints. 16 GB of storage was too little for the iPhone 6s when it came out. This forced iPhone users to micromanage their on-device storage, not install too many apps, and be careful about capturing too many photos and videos. Just like with 16 GB iPhones, Apple is offering a bad experience to try to sell more storage—this time, digital storage. iPhone users shouldn’t be forced to micromanage their iCloud storage. Here’s the really sad thing: That $0.99 per month iCloud storage plan for 50 GB is a pretty good deal. Most people could probably get by with this 50 GB. For a dollar a month, it’s a pretty cheap service. If you want to use iCloud Photos without the nags or micromanagement, it’s a good deal. Most iPhone users should certainly consider spending the 99 cents every month. But come on, this is not great. 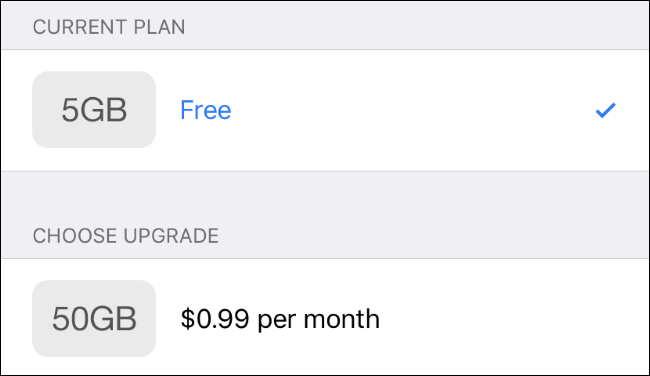 Apple sells premium products at a premium price, and it shouldn’t be nickel-and-diming its customers for 99 cents a month to use them properly. Google offers 15 GB of free storage space for Google accounts. You can also upload an unlimited amount of photos to Google Photos at 16 megapixels or below—and those photos don’t even count against your 15 GB. The photos your iPhone takes will be compressed a tiny bit, but should be stored at nearly the same quality level. We highly recommend Google Photos if you don’t want to use iCloud Photos or pay for additional iCloud storage on your iPhone. When you buy a new Chromebook, Google will throw in 100 GB of free Google Drive storage space for two years. And Chromebooks are a lot cheaper than iPhones! Amazon also offers unlimited storage of full-resolution photos with Amazon Prime via the Amazon Photos app. Sure, Amazon Prime is more expensive than $0.99 a month, but Prime includes a lot of benefits, and there’s a good chance you’re paying for it anyway. Apple could do more. Even just 15 GB of additional free iCloud storage space for everyone would go a long way. If Apple doesn’t want to be too generous, it could include two years of more iCloud storage with each purchase of a new iPhone. Or hey, Apple could bundle some additional iCloud storage space with AppleCare+. Buy the service plan and get some free space. That would make a lot of sense. It’s not even about the money. 99 cents a month isn’t much. But it’s insulting that Apple comes asking for some pennies right after you buy an expensive device. That iPhone should just work well—without the nags, upsells, and $0.99 charge every month on your credit card bill. We’re not the first people to say this, of course. The Verge called for Apple to boost the free iCloud storage allotment earlier this year and John Gruber said 5 GB “seems ridiculous.” But more people need to say it, just as it took a storm of public criticism before Apple boosted iPhone base storage from 16 GB.